The hardy and enduring Siberian Husky is a northern dog breed well acclimated for harsh, frigid temperatures. They have a thick, multi-colored coat that serves them well in cold weather. Anyone who sees a Husky is taken back by their beautiful coat; and owners know they have quite the job keeping their Husky well-groomed. But there are ways to help make the grooming process easier and more fun for you and your dog. Most dogs with origins from Northern climates have thick, luxurious coats such as the Chinese Chow Chow the Great Pyrenees, and the Bernese Mountain Dog. Their coats were adapted to the frozen climates they were from. But one thing that is very different with these cold climate dogs is they have a ‘double coat’ of fur. In the winter, they have an undercoat that is thick, wool-like, and keeps them protected from the cold. In the Spring, they shed these coats within a period of usually a month to reveal their Summer coat. This shedding period can vary from a month to a couple of months. In order to help the process to go faster, it’s essential to making a habit of brushing, combing, and incorporating regular baths in your schedule. 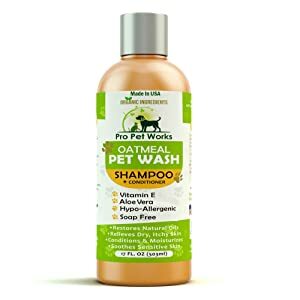 The Pro Pet Works Natural Oatmeal Dog Shampoo is a gentle shampoo if you find you have to bathe your dog more often. Once the second, winter coat is shed, the Siberian Husky will enjoy a lighter covering of fur that protects them from the sun and elements, but keeps their body temperature cooler. It is not recommended to shave your Husky, which exposes their skin to hot sun and can cause irritations and hot spots. It’s best to let them shed naturally. This shedding is a once a year process and as long as you know the cycle of shedding, feed you Husky good quality food, and choose the right shampoo for a Husky, it won’t become a difficult chore. We will be taking a look at the Husky’s coat and how to groom your pet for their health and to prevent excessive shedding. The Husky’s coat is different from a single-coated dog breed. Single-coated dog breeds shed all year, building up extra fur for the winter and then shedding more in the Spring. But with a double-coat meant to protect them from frigid cold climates, there is more involved to grooming your Husky. But that fluffy, thick fur is manageable and the larger shedding is taken care of by nature. Regular brushings, bathing, and occasional conditioning will keep your Husky looking like a show dog and keep them comfortable and free of skin irritations. And keeping up with their shedding will help to keep your house free of a build-up of fur, making vacuuming a more frequent cleaning chore. Out of all the double-coated dog breeds, the good news is a Husky requires a bit less grooming than other breeds. The best thing to start with is a regular, weekly brushing. This step is important and should be done thoroughly each week. Two essential grooming tools are a wide-toothed comb such as a horse tail comb, and a softer, thick paddle brush. The comb will break up knots and help you find matted areas. Comb carefully as a hard pull on a mat can hurt your dog’s skin. Combing helps bring up the undercoat also during the Spring shedding process. You can easily remove big fur balls of the undercoat with a good comb. A wide comb gets more fur at one time. The softer, thick paddle brush sold for grooming your dog will smooth the coat and help bring the shine out. When you brush with a paddle brush, use medium to heavy strokes in the direction the fur grows. You can use this time to relax your dog with slow strokes while they’re lying down and comfortable. Perform both these routines each week. After a long winter, right as Spring begins, pay attention to your Husky’s coat. In four-climate areas, March will begin the winter coat shedding for your Husky. If you aren’t regularly brushing your dog, you will notice large clumps of undercoat gathering on the surface and falling out. To speed up this process and keep your dogs fur from excessive matting, brush your dog more often; daily if needed. This will reduce how long the Spring shedding takes and alleviate the fur build up in your home. The Husky does not need to have their fur shaved off by a groomer, or shaved off at all. They grow their coats and naturally shed them to accommodate the warmer seasons. Their shedding season will go along with the temperatures in whatever climate they live in. Because the Husky does not produce a lot of skin oils, they don’t need to be bathed often. A bath is only needed every few months unless they get into a mess and become dirty and smelly. When you bathe your Husky, the bath will aid in removing extra fur, especially during the shedding of their winter undercoat. 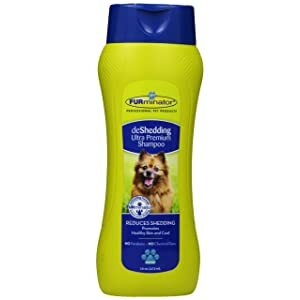 This is a great way to help with the extra fur and the FURminator deShedding Ultra Premium Dog Shampoo helps to make this process more effective. Use a screen for your bathtub if you bathe them inside, as there will be a lot of hair you don’t want going down the drain. Rinse them well to get rid of leftover shampoo and conditioner. Some pet grooming shops have bathing stations you can rent with large tubs and plenty of room. These are helpful when needing to bathe your Husky inside. The wrong shampoo can dry out or dull your dog’s fur. A Husky’s double coat needs a shampoo that will replenish natural oils and not dry out or irritate their skin. Be sure to buy dog shampoo and conditioner and never use shampoo for people. These can irritate their eyes or get into their ears and cause redness, or an ear condition. Look for dog shampoos that are mild, provide a deep cleaning, and are easy to rinse. If your dog is sensitive to strong smells or you, yourself, have chemical allergies, look for a dog shampoo that’s hypoallergenic. The thick fur of a Husky makes it difficult to see down to their skin, so you want a shampoo that can reach down through their fur to cleanse their skin and keep it healthy and free of skin irritations. There are shampoos with antibacterial ingredients but they are only necessary if your veterinarian requires you to use these or if your dog came into contact with rancid water or soil. ProPet makes this natural oatmeal dog shampoo with your dog’s health in mind. It’s been created for your dog’s sensitive skin and helps to keep their skin moist with ingredients like almond oil and aloe vera. There’s no scent or fragrance added to their shampoo making it hypoallergenic, but it prevents that wet dog smell by leaving your dog’s coat truly clean. If your Husky any allergies, this shampoo will not cause an allergic reaction, and it can soothe flea bites. ProPet Natural Oatmeal Dog Shampoo detangles fur making it a great choice for your Husky. There are no added ingredients like soap or detergent so you can use it if you need to bathe your dog often. The company cares what goes into their products and makes this shampoo with organic oils and adds vitamin A, D, and E. Your Husky will have a shiny, soft coat after a bath with ProPet shampoo! Some dog owners complained of dry skin and fur after bathing their dog with this shampoo. 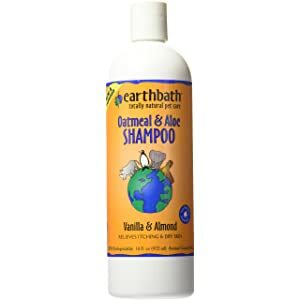 Earthbath All Natural Pet Shampoo is made with two essential vet-recommended ingredients; oatmeal and aloe. Both natural elements promote skin healing, keep your dog’s skin moist, and prevent skin irritations. This natural shampoo is safe to use after a topical flea treatment and is 100% biodegradable. Their shampoo line includes many scents and benefits: Eucalyptus & Peppermint relieves irritated skin and cools rashes. Fragrance Free is for dogs or owners with chemical allergies. Mango Tango helps with detangling, but some dogs may be allergic to it. Mediterranean Magic has a gentle rosemary scent. Orange Peel helps clean up after those very dirty dog adventures. Tea Tree Oil and Aloe help with hot spots on your dog’s skin. Oatmeal & Aloe relieves itchy skin. All shampoos have been ‘people’ tested by the owner of the company! Dog owners with pets who have sensitive skin found this shampoo made their dog itchy after bathing with it. 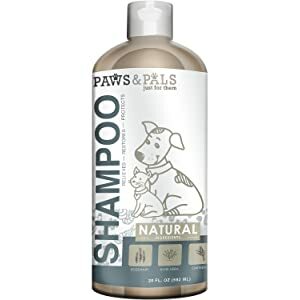 Paws & Pals Natural Dog Shampoo contains all natural aloe, jojoba, and coconut oils that alleviate irritated or itchy skin. It’s a great shampoo to smooth and add moisture to your Husky’s coat, and it won’t irritate your dog’s eyes or nose. Paws & Pals is a vegan product for those who prefer the vegan lifestyle. They’ve created this premium dog shampoo with the proper balance of oils and Shea butter for a superior Veterinarian coat care product. Your Husky will appreciate the clean, comfortable feeling after you’ve given them a bath using this natural and eco-friendly shampoo for dogs. No irritants are used in the ingredients so your dog’s eyes will not tear up from harsh soaps and will not irritate their nose. Dog owners found trouble rinsing the soap suds out, which caused their dog to get a rash. When your Husky starts their Spring shedding, the FURminator deShedding Ultra Premium Shampoo will help to loosen the undercoat, so it will fall out easier and comb out faster. This shampoo will provide a cleansing bath that not only helps loosen fur, but also helps your dog’s skin to be clear and itch free. Furminator adds no chemicals and adds natural ingredients like Calendula extract, Papaya Leaf extract, and Omega fatty acids for a soothing bath. Your Husky will appreciate the dreaded bath that’s part of a good grooming routine when he feels the refreshing affects of this healthy shampoo. Use this for regular bathing and during their high shedding season. Husky owners felt this shampoo did not help loosen their dog’s fur to help with shedding. 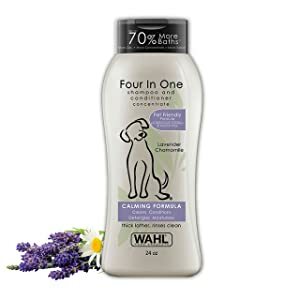 Wahl’s dog shampoo is made with calming lavender and chamomile while it cleans and moisturizes your dog’s skin. It’s great for detangling your Husky’s longer fur and preventing matting. You dog’s coat will be soft, clean, and shiny when you bathe them with this shampoo for dogs. Wahl’s uses plant derived ingredients and leaves out the harsh chemicals like PEG-80, alcohol, and is PH balanced. 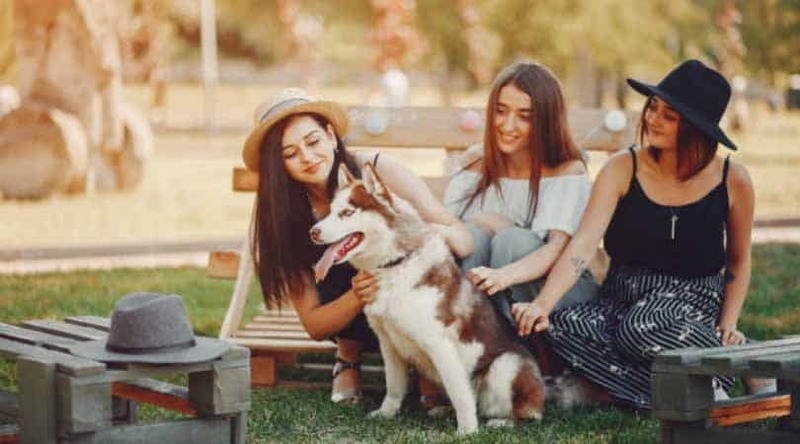 Even though your Husky has thick, thick fur, you can use less of this dog shampoo from Wahl’s because of its higher concentration and additional surfactants. This helps you to make the shampoo last longer. Wahl’s shampoo is pet friendly, creates a thick lather, and rinses completely leaving your dog’s coat soft and clean. Dogs with sensitive skin may develop a red rash and itching. Whether you have one Husky or an entire pack of Husky’s, they’ll grow up and become family members that win your heart. Their thick, beautifully colored fur, friendliness, pleasant demeanor, and beautiful eyes are all attractive characteristics of the Siberian Husky. Keeping your dog healthy, happy, and well-groomed is a commitment that requires regular care. It helps to have a grooming schedule for your Husky to keep ahead of the season when they begin shedding their undercoat. It’s also a great time to connect with your dog; grooming then can be a relaxing exercise for you and your dog. Combing and brushing them is therapeutic and a personal time between you and your dog. Of course, bathing them can be a challenge, but with the right tools and a good shampoo, you and your dog will be glad you bathed them. Especially with their love of running and active personality, your Husky will end up having a run in with mud, dirt, a slimy pond, or other elements to cause them to need a good bath. By following the advice in this article, we hope to help make your dog’s bath time easier on you and your dog! It’s worth the beautiful results as their colorful and bright white coat shines and reveals the beauty of these dogs. Now that you’ve learned about caring for their coat, and learned about the best shampoo for a Husky, you can rest assured that owning and grooming a Husky will not be as challenging as you thought. We hope these reviews will assist you when you shop for shampoo for your beautiful Husky! The ultimate place to be able to bathe your Husky is outside! Choose either in a kiddy pool, or out on the deck or grass where soap, water, and fur can easily be shaken off. Outside, it’s easy to set up an area to bathe your Husky: a hose, a bucket with water, your shampoo, possibly a kiddy pool, and some old towels. You may want to have a harness on your Husky and leash to steady him and prevent him from running off. Most any dog is never happy to take a bath. They love to jump in the river or lake, but for some reason a bath is their least favorite activity! Hose your dog down until their fur is absolutely soaked with water. This ensures the shampoo can get through all of their fur. Apply a line of shampoo starting behind their head and down toward their tail. Use your hands to lather in the shampoo and distribute the shampoo down their sides and stomach area. The urge to ‘shake’ will start. Let them! It’s their way of getting rid of the extra water and will help you when you rinse them after the bath. Now put shampoo in your hand and rub it on each leg, their backside, and their tail. Work it into a lather again and then rinse. This is the most important part of the bath time. It’s important to rinse thoroughly so there won’t be leftover shampoo. The leftover shampoo will dull their coat, pick up dirt, and irritate their skin. Once you’re sure the rinse is done, wrap them in a towel to get the extra water off. Then, let them run! Being aware that they will roll so you don’t want them to be able to run where there is dirt or mud. You can block off the stairs to your deck or constrain them in an area of the yard without dirt. After a few hours, when they are mostly dry, then brush and comb them being careful not to pull hard on their fur. When they are completely dry the next day brush once more to remove any leftover, loosened fur. Inside bathing is just like outside, except you have to accommodate for the room you bathe them in. A bathroom is best, but have extra towels placed over counters and appliances to prepare for the deluge of water. Fill the bathtub halfway with lukewarm water ‘before’ you bring your dog in. Have your shampoo handy, extra towels, and keep the shower curtain inside the bathtub. Once you put on the harness and leash, lead your dog into the bathroom and encourage them to hop into the bathtub. Most will, but the reason you want everything ready before they are inside, is so you can get them right into the bath. Follow the rest of the instructions for outside except to dry them more in the bathroom before you let them loose in the house. Expect some shaking and splashing of extra water, so close off extra rooms where you don’t want to have to vacuum or mop. It’s good to have several towels on hand to periodically rub their coats to absorb extra water. Now that you’re ready to groom your Husky, and if it’s time for a bath, here are our top 5 shampoos recommended for Husky’s to make your job easier!